As the first decade of the new millennium drew to a close, the Missionary Society of Saint Columban was fast approaching its centennial anniversary. In 2010, the Columban U.S. Regional Director, Father Arturo Aguilar, formed a committee to discuss the possibility of writing a book for the centennial on the history of the Columbans in the United States. 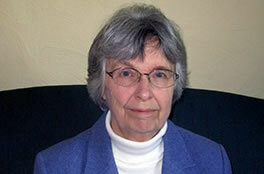 He invited a long-time friend of the Columbans, Franciscan Sister Angie Dries, to advise the committee. A native of Wisconsin, Sister Dries is a professor emerita from Saint Louis University, with a distinguished background in writing, education, and publishing on U.S. Catholic history. At one of the committee meetings on July 20, 2010, Sister Dries recommended that the Columbans initiate an oral history interview project for the current Columban Fathers, and hire an archivist for the Columban U.S. region. The Columban Fathers followed her suggestions, starting an Oral History Project in February 2011 and officially inviting Sister Dries to write the Columban U.S. History book in early 2012. In the spring of 2012, the U.S. Columban Fathers hired a full-time archivist to organize their records in preparation for the centennial. In July 2012, Sister Dries submitted her budget proposal for her book project, and she officially began work on the Columban centennial book in the autumn of 2012. The Columban U.S. archives have provided invaluable insight as the Society approaches its 100th anniversary, including coordination with Columban archivists in Ireland and the Philippines to uncover the treasures of Columban history. Sister Angie Dries and her book will serve as an excellent venue for informing Columban friends and the general public about the amazing achievements of this Society.